Indonesia is the largest archipelago country in the world with more than 17,000 islands. Due to the vast territory of Indonesia, Indonesia becomes a home to many fauna and flora. In addition, Indonesia is also a transitional region between some of the world’s flora and fauna regional habitats. 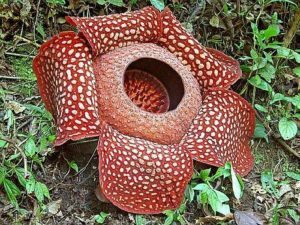 As a result, Indonesia being a home to endemic species of plants including more than 40,000 flowering plants, 5,000 species of orchids and giant flowers (Rafflesia arnoldii), which is the largest flower in the world. If the number of plant species present in Indonesia is summed, then the amount will be 11% of the world’s plant species. 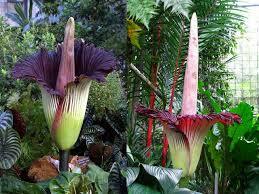 Titan arum is commonly referred as “Bunga Bangkai” by local people. The word “Bangkai” means a corpse, and this naming is given because it produces a bad odor that serves to attract beetles and flies for flower’s pollination. This plant is a rain forest endemic flora in Sumatra Island and spread mainly in the area of Bengkulu and Lampung. It can reach a height up to about 2 meters with a crown around of 1-5 meters. Despite its large size, Titan Arum is not a large flower because the actual Titan Arum consists of thousands of small flowers which grow on the same stem. The process of growth from seed to flower takes about 3 years. Currently, the seeds of Titan Arum have been cultivated for preventing this species to extinction. Rainbow Gum or also called Rainbow Eucalyptus. It is one species of Eucalyptus that can be found in Indonesia. Many of these species can be found in rain forest of Sulawesi Island and Mindanao. 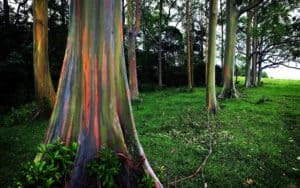 The species Eucalyptus deglupta is the most common species that grows in Indonesia. This plant is very unique because of it is colored like rainbow. It is characterized by the smooth surface of the bark with an attractive and extraordinary style. The outer bark of the tree will change at a certain time, at first, the bark looks bright green then it will be mature and become blue, purple, orange or scarlet. This tree widely used mainly as pulpwood for making white paper in paper industry. Jasmine (Jasmimum sambac) is a native tropical plant that is found in almost all territory of Indonesia. Indonesian usually call this flower “Melati”. Generally, Jasmine flowers may grow in the forest and lately is also cultivated as an ornamental plant. This flower is white and has a specific aroma. 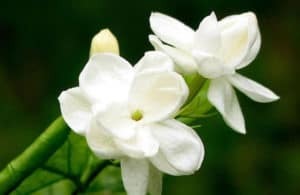 In Indonesia, white jasmine is used as a national symbol because its color symbolizes purity, sacredness, and sincerity. In addition, Jasmine flowers are widely used in Indonesia as a sowing flower, ingredients of perfume, cosmetics, jasmine tea and also some traditional activities by local people. We may found this flower as the ornaments in traditional wedding in Indonesia. Anggrek Bulan (Phalaenopsis amabilis) is one of the orchid species which is also known as Moon Orchid. This flower is one of Indonesia’s national flowers that grows widely in Indonesia. Moreover, It is officially recognized as national “flower of charm” (puspa pesona) in Presidential Degree No. 4 in 1993. The characteristics of this plant are a green leaf with elongated shape accompanied with a white root with a fleshy round shape. When blooming, this flower has a bit of fragrance and can bloom up to 10 cm in diameter or even more. Within a year, Anggrek Bulan can bloom up to 3 times with a long blooming time. Rafflesia arnoldii is an obligate parasitic plant that grows on the trunk of Liana vines from the Tetrastigma genus. In Indonesia, this plant is the identity of the province of Bengkulu. Then, it became one of the rare floras of the National flower of Indonesia. It is widely known as a huge flower and local people also call it “corpse flower” due its horrible odor. The distinctive form of this flower is the presence of five orange colored crowns with white spots and also with a coarse texture. At the time of the bloom, the flowers can reach a diameter up to 70-110 cm with a height of 50 cm and weight up to 11 kg. In addition, the produced horrible odor from this flower is used to invite insects to help its pollination. Black orchids are an orchid species that grows on the Malay Peninsula, Borneo, and Sumatra. 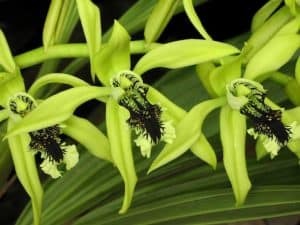 The flower, has Latin name Coelogyne pandurata, is a flora mascot of East Kalimantan Province. A lot of people from all over the world try to collect this flower due its beauty. This orchid is very distinctive because it has a black tongue (labellum) with a few lines of green and is hairy. When blooming, the flowers will produce a fragrant scent and usually bloom in March to June. 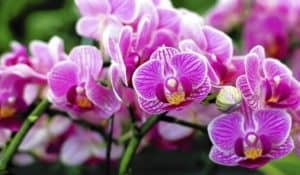 However, it is unfortunate because at this time the number black orchid has started to decline because of deforestation in Indonesia. And nowadays we still can find Black Orchid in Kersik Luway natural conservation or even in the ornamental plant collector. Javanese Edelweiss (Anaphalis javanica) is an endemic flower that grows in Indonesia. This flower is found in many mountains located in Java Island, northern Sumatra, northern Sulawesi, and Lombok. However, nowadays this flower is also categorized in rare flora of Indonesia. 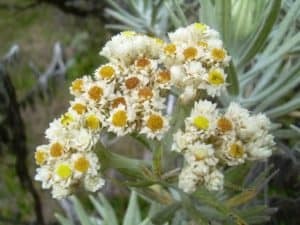 Edelweiss is plant that may grow in vulcanos and can resist the extreme weather of volcano. As a mature plant, this plant can grow up to 8 meters high but in general this plant only grows less than 1 meter. Within a year, edelweiss flowers will bloom in April to August. This flower is liked by a lot of insects like butterfly, fly, bee, and the other. Usually these flowers will be dried and famous as a souvenir. On the other hand, it also fact about edelweiss flower in Indonesia in Edelweiss flower facts article. 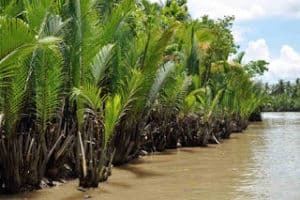 Nipa (Nypa fruticans) is a kind of palm that grows in a mangrove environment or tidal area near the waterfront. 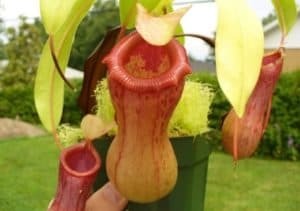 This plant may be found almost in all area in Indonesia. In Nipa tree’s trunk, its rhizome agrow the typical leaves that are specific to palm families. It may up to 9 m above the ground. Nipa is widely used by locals from its root, trunk, until its leaf. In some areas of Indonesia, the feathery leaf of Nipa is traditionally used to make roofs. On the other hand, the leaf is also used to wrap tobacco for smoking. In addition, this plant can be used in handicrafts, cigarette packaging material, wood fuel, pulp making, even as food. In Indonesia, this plant can be found growing in Kalimantan and Sumatra. This plant can reach 15-20 m high by climbing the other plants nearby. The physical feature of this plant is the tendrils on its tips of leaf that form a pocket and are used as a trap for prey (insects, frogs). With the existence of special enzymes, these plants can digest the trapped animals and change it as a food source. It is also known that this plant has a mutual-ism symbiosis with bat. The bat usually sleeps in this plant’s pocket and the bat’s feces will fertilize the plant. Teak tree or also called Pohon Jati is a tree that produces high quality timber in Indonesia. 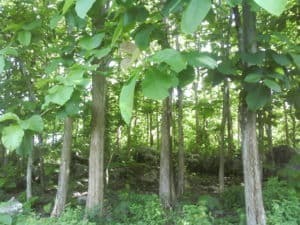 The tree, which has a latin name Tectona grandis, is widely spread in Java, Bali, and Nusa Tenggara. However, in recent years it is also cultivated in Southern Sumatra and Southern Kalimantan. This tree is straight and can grow up to 30-40 m for hundred years. During the dry season, the tree can survive by falling of its wide leaves. Moreover, this tree is very special because it has a strong, durable, and beautiful wood. Usually Teak wood will be used in the manufacture of furniture, carvings, buildings, and many more. In addition, the leaves of this tree can also be used as traditional food wrappers in some areas of Indonesia. Cloves (Eugenia aromaticum) in Indonesian is called Cengkeh. This plant is a native Indonesian plant that is widely used as a seasoning and the main ingredient of making cigarettes. The part of this plant that is usually used is its dried flower which also has a distinctive aroma. In Indonesia, cloves have been well known from the Dutch colonial era and are commonly found in the Banda islands. Yellow sandalwood or Cendana (Santalum album) is a tree that produces sandalwood and sandalwood oil. In Indonesia, this wood is mostly found in East Nusa Tenggara, especially in Timor Island. The fragrant sandalwood is now very rare and the price is very expensive. Usually sandalwood is used as spices, incense materials, aromatherapy, a mixture of perfume, as well as dagger’s cover. Damar (Agathis dammara) is a native Indonesian plant that spreads in Java, Maluku, and Sulawesi. The wood from this tree is not strong so it is rarely used in construction. But this plant produces Damar Gum which is then processed into copal and become a large export commodity for Indonesia. Ulin (Eusideroxylon zwageri) is a woody tree that is typical of Kalimantan Island. In addition, this plant is also commonly found on the island of Sumatra. Ulin tree is a large tree species that can reach 50 m high and 120 cm diameter. In general, this wood is used as a building material because the wood is very hard and resistant to weather changes. Malay Padauk or often called Angsana is a tree that has a high quality of timber with a high selling value. This plant can be found widely in tropical rain forest in Indonesia. The wood produced by this tree is very hard and reddish. In addition, this tree’s wood has a unique motif and is very popular for Indonesian people. Because of its specialty, this wood is widely used in both light and heavy construction. With beautiful motifs and wood fibers, Malay Padauk tree can also be used in making of furniture, musical instruments, high-class cabinets, and the handle of equipment. Those are the explanation of 15 Native Plants of Indonesia. We all know that Indonesia is very rich in biodiversity. By knowing the native plants of Indonesia, we become more familiar with another fact of Indonesia. Then, if you want to know more about Indonesia, stay tuned for another unique facts of Indonesia from us.